It’s not a holiday at our house without some kind of baked ham. With that said, we don’t normally have baked ham unless it’s a holiday :). 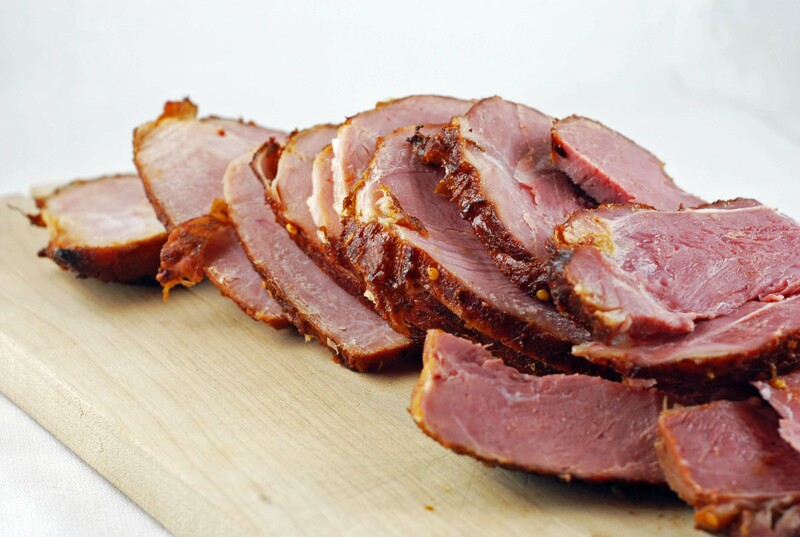 Last year, I experimented baking our own honey baked ham at home to see whether it would really make a difference. And yes it did! This ham did not disappoint. It was tender, juicy and full of flavor. I love how thew red pepper flakes added a little bit of tang to the sweetness of the honey glaze. Skip the store-bought ham, and try this one instead. While it takes time to make, it’s really worth the wait. Line a standard size roasting pan with aluminum foil, and place ham with rounded side up. Bake for an hour. In the meantime, mix the rest of the ingredients in a medium sauce pan, oven medium heat. Stir occasionally until it forms a thick glaze. Use 1/2 of the glaze to coat the ham, and continue to bake for another 30 minutes. (If the glaze thickens up, let it heat back up for a few minutes until it reaches the consistency to coat). Flip the ham, use the remaining 1/2 of the glaze, and finish baking for another hour. Let stand for 30 minutes before slicing to serve. I’m always on the lookout for a new delicious dish that can be prepared in a slow-cooker. My weekly recipe rotation consists of one slow-cooker dish; and I don’t know about you guys, but I need variety!!! Trust me, I understand first hand how difficult it is to get a nice dinner on the table during the week where we seem to be on the race against time. 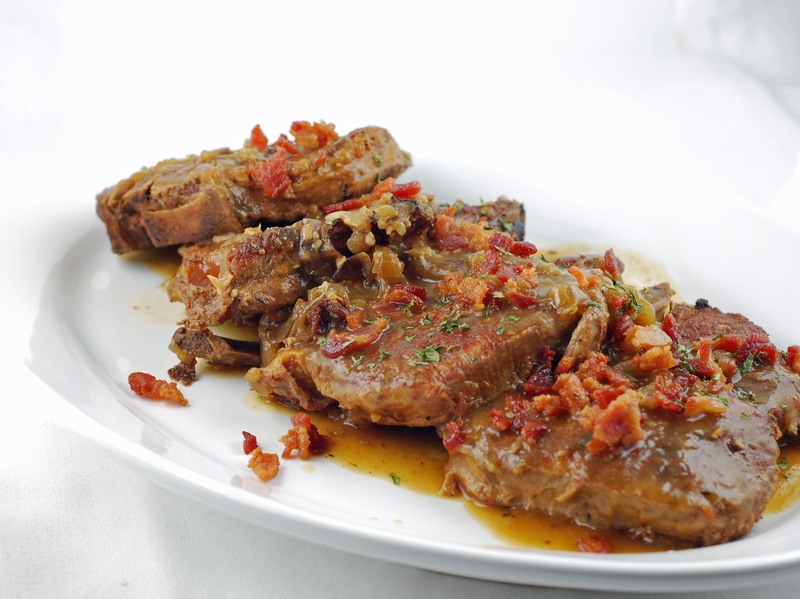 This recipe is attractive to me because I have never cooked pork chops in a slow cooker before; and it also uses bone-in blade cut pork chops. This dish requires a little bit of prep time in the beginning but I promise you that the end result is worth it. I also don’t have time in the mornings to prepare my slow cooker, therefore I prepare everything the night before, cover the slow cooker insert with the lid, and leave in the refrigerator overnight. That way, I can just put the insert into the slow cooker in the morning and turn it on, which only takes two minutes. These pork chops were fork-tender, melt-in your mouth delicious, with gravy that was equally rich and decadent, without being too heavy. Finally, I love how beautiful the final product was. We enjoyed this with another household favorite Mustard Roasted Potatoes, but I think they’re great with hot egg noodles, rice pilaf, or mashed potatoes. Yum! I will be making this again very soon. Happy cooking! Fry the bacon in a skillet until they are crisp. Transfer bacon to paper-towel lined plate, and leave the bacon fat in the skillet. Refrigerate the bacon. Meanwhile, pat the pork chops with paper towel until they are dry and sprinkle both sides with salt and pepper. Heat the bacon fat until it smoking. Fry 3 chops at a time, about 3 minutes on each sides until they are golden brown. Then transfer to the slow cooker insert. Repeat process with remaining chops. Pour off all but 1 tsp of bacon fat from the skillet; add onions, 1 tsp light brown sugar, 1/4 tsp salt and 1/4 cup water to the now-empty skillet. Using a wooden spoon, scrape the browned bits from the pan and cook over medium high heat until the onions are soft, approximately 6 minutes. Add garlic and thyme and cook until fragrant, approximately 30 seconds. Pour this mixture into the slow cooker insert over the pork chops. Add broth, soy sauce, and remaining 1 tbsp brown sugar to the skillet, bring to a boil and add the bay leaves. Pour the mixture in the slow cooker. Cover the slow cooker, and cook either on high for 4 hours or low for 8 hours. When ready to serve, reheat the bacon in a large saute pan until crisp. Transfer bacon to a small bowl. Slowly, transfer the pork chops into a large platter, and tent the plate with an aluminum foil. Remove bay leaves from the crock pot, and pour the liquid through mesh strainer into a large saucepan. Transfer the solids into a blender along with 1 cup of the cooking liquid, and blend until smooth. Stir back into the remaining liquid in the saucepan. Mix the cornstarch and remaining 2 tbsp water together in a small bowl and stir into the sauce. Cook over medium heat for approximately 8 minutes. Add vinegar, and season with salt and pepper to taste. Pour the sauce over the chops and sprinkle with bacon and parsley. Serve. Red and I love leisurely breakfast on the weekend… so much that sometimes we have a couple courses of breakfast meals. Usually, since I am not too patient with waiting 30 minutes or an hour until something is ready (depending on what I will make); I will start off with a cup of coffee or orange juice and a tiny slice of this super duper Easy Banana Bread, that I may bake a few days prior to the weekends. And then I will start baking or making my second breakfast course. 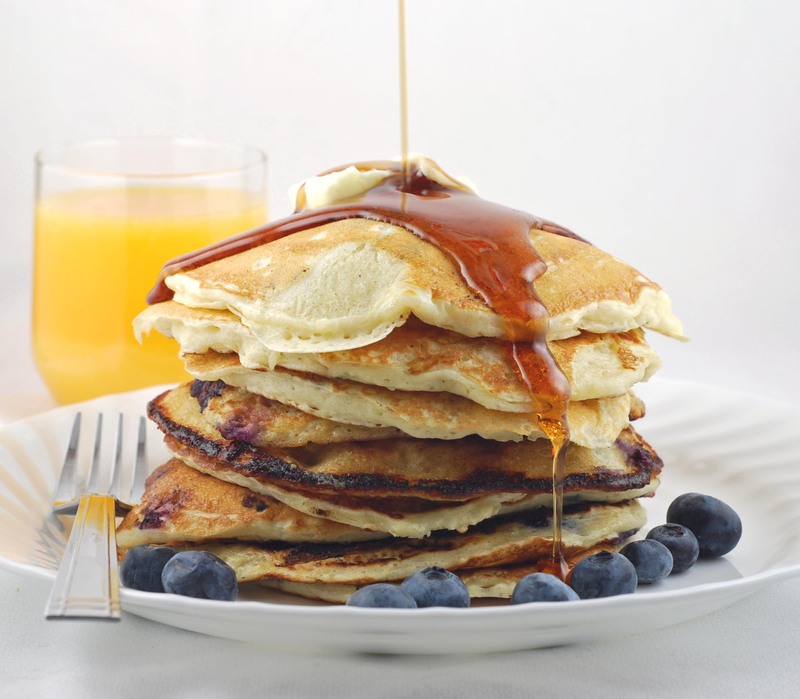 Pancakes are definitely one of my favorite meals, breakfast or dinners. I love these sweet and tangy Banana Sour Cream Pancakes; but I needed to use up my buttermilk in the refrigerator – and I happened to have a pint of blueberries and no ripe bananas. These pancakes were hands down “out of these world”. Red was like, “Why haven’t we tried these sooner?” I shook my head in agreement. They were fluffy and light, not too sweet, pretty much “melt in your mouth”. They are in the little bit flat, so if you’re looking for “cakey” pancakes – these are not for you. I didn’t change a thing about this recipe. I think they’re almost a cross between the “cakey” pancakes and crepes, but they were to die for. Definitely a big favorite at our house, and I will be making these again soon! I added blueberries to mine; and I am sure that they will be fantastic with other add-ins as well, like dried cranberries or other fruits, chocolate chips… the possibilities are endless! Happy eating! Heat griddle to 375 degrees if you use electric; or regular pan on the stove. Whisk together all of the dry ingredients in a medium bowl. Add all liquid ingredients; whisk to combine. Batter should have small to medium lumps. Do not over-mix – and leave those lumps alone. Don’t try to mix them into the batter. Test griddle by sprinkling a few drops of water on it. If water bounces and spatters off griddle, it is hot enough. Brush remaining 1/2 teaspoon of butter onto pan or griddle. Wipe off excess with a paper towel. Heat your oven to 200 degrees. Using a 4-ounce ladle, about 1/2 cup, pour pancake batter, in pools 2 inches away from one other. When pancakes have bubbles on top and are slightly dry around edges, about 2 1/2 minutes, flip over. Cook until golden on bottom, about 1 minute. They will spread, make sure that you don’t over-crowd the griddle/pan. Pasta can be considered a main staple at our house. Along with pizza, this is a dish that shows up on our menu every week almost all year long. We love the little blue box of macaroni and cheese that takes less than 10 minutes to whip up, but also appreciate the grown up version like this one. The bacon (who doesn’t love them! 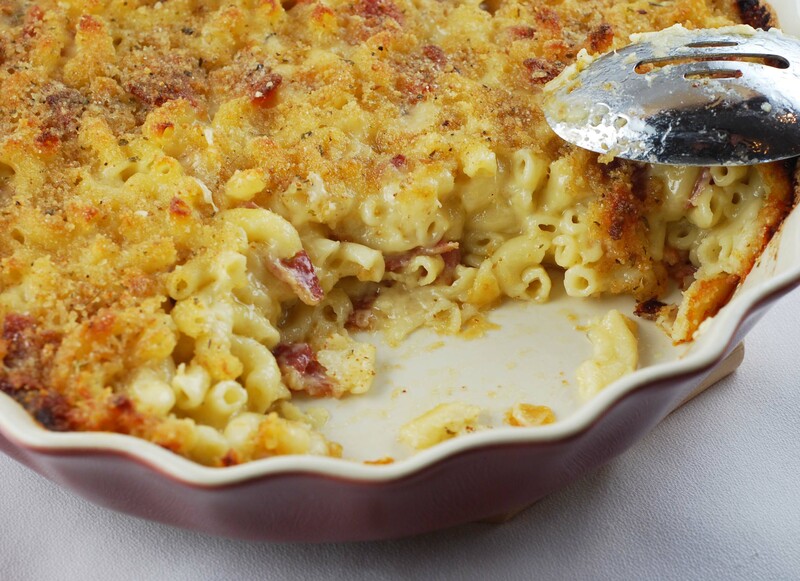 ), blue cheese, gruyere and cheddar really add nice complex flavors to the everyday macaroni and cheese. I’d say that this is something that is worth turning on your oven for in the summer. Happy eating! Meanwhile, heat the milk in a small saucepan, but don’t boil it. Melt the butter in a medium pot and add the flour. Cook over low heat for 2 minutes, stirring with a whisk. While whisking, add the hot milk and cook for a minute or 2 more, until thickened and smooth. Off the heat, add the Gruyere, Cheddar, blue cheese, 1 teaspoon salt, pepper, and nutmeg. Add the cooked macaroni and crumbled bacon and stir well. Pour into 2 individual size gratin dishes. Mix the bread crumbs with chopped basil. Sprinkle the bread crumb mixture over the top of the pasta. Bake for 35 to 40 minutes, or until the sauce is bubbly and the macaroni is browned on the top. Nothing can beat a steaming plate of hot cooked spaghetti slathered in delicious marinara sauce… and then topped with delicious meatballs! This recipe is so versatile, you can either enjoy these meatballs with pasta (the traditional way). Or you can serve them as individual appetizers with variety of sauces; although I must add that these meatballs are very flavorful on their own. For healthier option, I used ground white turkey meat mixed with turkey sausages (for flavor). The mixture was also very soft, so I thought that baking them may make it easier and help the meatballs hold their shapes better. I baked these meatballs for about 30-40 mins at 350 degree. It was also a lot more convenient than trying to fry them in a pan several batches at a time. I put them on to two baking sheets (because I doubled the recipe), and rotated the pans halfway through. Finally, I had some leftover spinach, so I threw a few handful of that as well in my marinara sauce. I used my favorite jarred marinara sauce, Rao’s. Transfer the meatball mixture to a serving bowl. I really enjoyed my adventures my slow-cooker in the past few weeks or so, making this Classic Pot Roast, then this Pepper Steak. Both times, it cranked out a wonderful meal that I don’t have to fuzz with when I got home from work..(a huge BONUS!!) 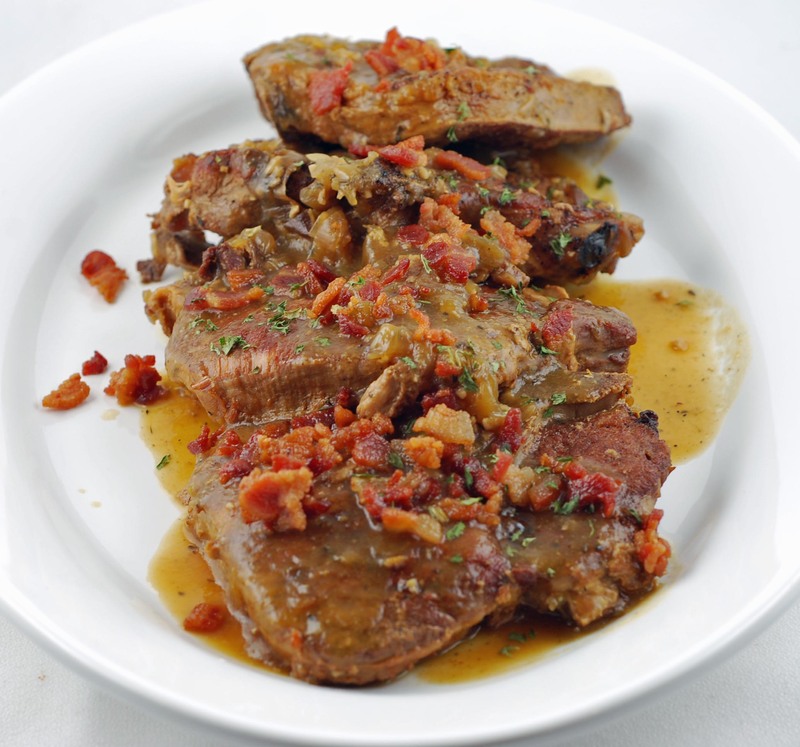 I really was not looking for a new recipe to try when I stumbled upon this recipe, originally was intended to be used with beef brisket. I noticed that they used chili sauce, apple cider vinegar, and brown sugar! I really think that the sweet and spicy combination of the spices would be excellent with meats that are slow-cooked. But then, I wasn’t able to find any beef brisket at my local grocery store. So here I was, making my first substitution. I thought that maybe a slab of chuck roast would do just fine! And I think it came out fabulously. My suspicion was indeed right: the sweet and spicy combination in the spices really added a nice kick to the ordinary slow-cooked meat. I made several changes to the original recipe-especially on the chili sauce, since we both love spicy food. Take the chuck roast and season with salt and pepper to taste. Brown on all sides in a large skillet over high heat. In the same skillet, cook and stir onions on low-heat for 8-10 minutes or caramelized. Place half of onions in a slow cooker; top with celery and roast. Combine the chili sauce, brown sugar, vinegar and the soup mix. Pour over the roast, top with remaining onions. Cover and cook on low setting for 6 to 7 hours or until the meat is tender. Let stand for 5 minutes before slicing and serving. I really haven’t had the time to post all of the delectable recipes we tried for Thanksgiving this year. But we finally survived making our very first turkey! The turkey breast was tender, moist, and flavorful. We decided to brine it using Martha Stewart Perfect Roast Turkey. Remove turkey from brine. Discard brine. Pat turkey dry inside and out with paper towels. Place, breast side up, on a rack set in a roasting pan. Let stand at room temperature for up to 1 hour. Preheat oven to 375 degrees, with rack in lowest position. Fold a piece of cheesecloth (about 3 feet long) into thirds, place inside turkey cavity, and open up to create a pouch. Loosely fill cheesecloth pouch with stuffing (do not pack tightly), and tuck in ends of cheesecloth to close. Tuck wings underneath the turkey, and tie legs together with kitchen twine. Brush turkey all over with butter, and season generously with salt and pepper. Roast turkey, basting with pan juices every 30 minutes and rotating the pan after 2 hours, until a thermometer inserted into the thickest portion of the thigh registers 165 degrees, 2 1/2 to 3 hours. Remove stuffing pouch, and then empty it into a 9-by-5-inch loaf pan. Cover if desired, and return stuffing to oven; bake until it registers 165 degrees, about 30 minutes more. Transfer turkey to a platter, reserving pan juices for gravy. Let turkey stand for 30 minutes before carving. You are currently browsing the archives for the main dish category.